I had everything ready for Tommy’s birthday. It was hard for him to go to sleep the night before; he was so excited. “Oh man, I knew I forgot something!” I joked. He was thrilled with everything. Yup, I got him a microscope. He loves that sort of thing. I drove him to school with (store bought) cupcakes for his class. Thank goodness his school still allows them. It infuriates me when schools don’t. 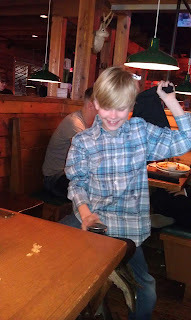 When he got home from school we went to Texas Roadhouse, his favorite restaurant. I had 3 rolls. And 5 sweet teas. I felt like we were on the Yo Gabba Gabba set. But the kids were all for it. I’m glad he’s not a shy kid like I was. I would have never gone out in front of people and danced at ten. Natalie, well, she’s still 4 so she’ll do anything in front of people, including having meltdowns that will probably embarrass her when she’s older. Unless she becomes one of the Real Housewives in which case, the meltdowns will continue into her adult life. And that would scare me. When we were about done with our food the waitress came back with a saddle and some other waiters and was like, “Hop on, birthday boy!” She patted the saddle. Tommy didn’t even hesitate. He climbed right over me and plopped right down. They sang Happy Birthday to him and he loved it. He was still laughing about Doggie Doo..
Tommy said it was the best birthday ever. Of course, he says that EVERY year. It struck me how long and lean he is looking. He's not a little boy anymore. What the heck? What a super birthday he had. You did good, mama! What a great birthday!!! You did a wonderful job for him! I've never been to TX Roadhouse before but I've heard it's great. Doggie Poo game. I know what I'm getting my grandson for his birthday. Looks like ya'll had such a great time. I do wish you could have posted pictures of your dancing. Who knew Texas Roadhouse was such a blast? Looks like he totally scored and had a great birthday! OMg, that dog poo game sounds like something my kids would love. LOVE! I'm glad he had a good birthday. You can't get much better than that. Well done!!! Now I really really really want a cookie cake. Looks like Tommy had a great birthday! Now that is my kind of party. Looks like everyone had a great time, especially the birthday boy. My oldest turns 10 this weekend. Can you believe how fast (and slow) the 10 years have gone? And who knew they dance at Texas Roadhouse these days? I did not . . . It does look like it was the best birthday ever! Happy Birthday!! Texas Roadhouse has the best rolls, how fun they made it so special with the singing, dancing and saddle, very cool. That sounds like a great birthday party. What a great birthday! Looks like so much fun (and good looking cake!). Actually, that does look like a fantastic birthday to me! Especially that cookie cake. What? Hawaii? Jealous! Wow, that looks like an awesome birthday. Such a lucky kid. Awesome birthday. My 5 year old nephew would've LOVED that angry birds cake. sheesh it LOOKS like he had the best birthday ever. LOTS of smiley pics! priceless smiles on your birthday boy! Looks like he had the best birthday ever! Well then sounds like each birthday has surpassed the others. Good track record! Sounds like a good birthday to me! Well everything but the danceing...I don't dance and forced dancing is even worse! Congrats on having brave kid! What an awesome birthday! He looks like he had so much fun, sounds like it too! That's so neat that you guys got to dance at the Texas Roadhouse, AND they had him sit on a saddle while they sung happy birthday! I can't believe he's so big, so I'm sure YOU can't believe it either! I just remember him being so little when I started reading on OD! Oh man, what cute kiddos. I LOVE cookie cakes. Glad he had a good b-day! Happy Birthday Tommy! You did a great job celebrating him. He is grinning from ear to ear in every shot. I swear that he and my little aspie would get along beautifully. He has that very same microscope and now that I know there is an Angry Birds cake, I will have to order it for him on his next birthday. And that poop game? That would be HUGE in my house. Awwweee Happy Birthday to your little guy. He looks so happy in all the pictures. I love that you got him the Doggy Doo game. I want to get that for my girls, it looks funny.